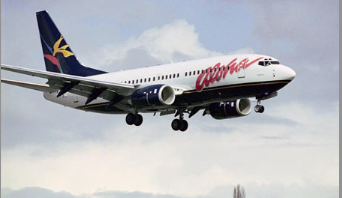 Aloha Airlines provides frequent convenient, all-jet service connecting the five major airports in the state of Hawaii. Aloha also provides the fastest, most efficient way to move air cargo between any of the islands. Aloha's unique transpacific service brings the Spirit of Aloha to Oakland in the San Francisco Bay area, Orange County's John Wayne Airport and Burbank Airport in the heart of Southern California, Las Vegas, Phoenix, and Vancouver, B.C. Aloha's Central Pacific routes connect Hawaii to Johnston Atolls and Kwajalein and Majuro in the Marshall Islands. A weekly charter serves Christmas Island in the Republic of Kiribati. Aloha also has earned a reputation as the innovator in interisland travel: the carrier was first in Hawaii to offer first class seating, Drive-Thru Check-In, Curbside Check-in, Express Kiosk Check-in and Electronic Ticketing.